The LED Node uses MOSFETs to drive the red, green, and blue LED strings, respectively. Well… in the LED Node v1, input pin B and resistor R2 are missing, and R1 is 10 kΩ. 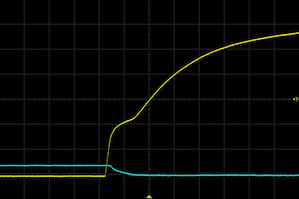 The yellow line is the input, a 6V signal in this case (not 3.3V, as used in the LED Node). 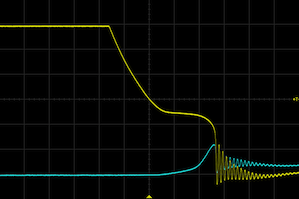 The blue line is the voltage over the MOSFET. The input is a 1000 Hz square wave with 20% duty cycle, i.e. 200 µs high, 800 µs low. When the input voltage goes low, the N-MOSFET switches off. In this case, I don’t use an actual LED strip as load, but a 1 Ω power resistor, driven from a 2V power supply line to keep the heat production manageable during these tests. So that’s 2 A of current going through the MOSFET, and when it switches off that happens so quickly that the current simply has nowhere to go (the power supply is not a very nice conductor for such high-frequency events, alas). As you can see, this signal ringing is so strong in this case, that the voltage will overshoot the power supply by a multiple of 2V. The horizontal time scale is 1 µs per division. The vertical scales are 0.5 V and 5 V (!) 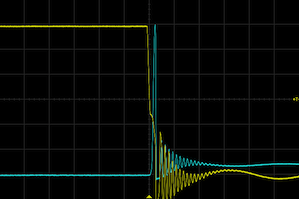 per division for the input (yellow) and MOSFET voltage (blue), respectively. 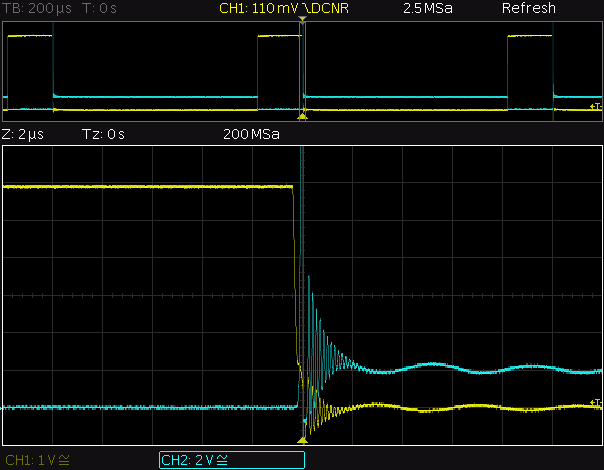 Note the 30V overshoot when turning that MOSFET off! This has all sorts of nasty consequences. For one, such high frequency signals will vary across the length of the LED strip, which will affect the intensities and color balance. But what’s much worse, is the electromagnetic interference these signals will generate. There’s probably a strong 5..10 MHz component in there. Yikes! What a difference! Sure, the flanks have become quite soft, but that ringing has also been reduced to one fifth of the original case. And those soft flanks (about 2 µs on the blue line) will probably just make it easier to dim the LED strips to very low levels. The little hump at about 1V is when this particular MOSFET starts to switch – these units were specifically selected to switch at very low voltages, so that they would be fully switched on at 3.3V. This helps reduces heat generation in the MOSFETs – an important detail when you’re switching up to 2 Amps. And indeed, the STN4NF03L MOSFETs used here don’t get more than hand-warm @ 2A – pretty amazing technology! 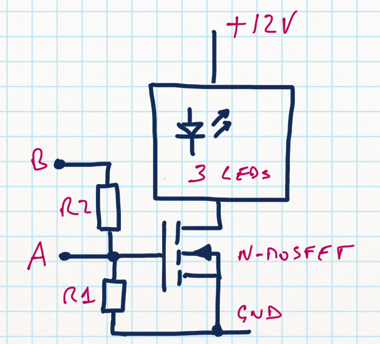 The new LED Node v2 will include those extra resistors in the MOSFET gate, obviously. And that 1 kΩ value for R2 seems just about right. The other resistor (R1) is a pull-down, it only serves to avoid unpleasant power-up spikes – by keeping the MOSFET off until the µC enables its I/O pins and starts driving it. 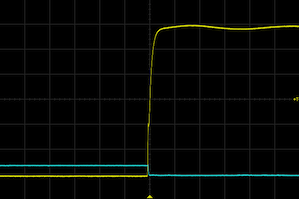 In case you’re wondering about the ringing on the yellow input trace: there’s something called the Miller effect, which amplifies the capacitance between the drain and the gate, causing strong signals on the output to leak back through to the gate. The input signal from my signal generator has a certain impedance and can’t fully wipe them out. What is the other, much lower (1/30th about 1 wave per 3 divs), frequency that you see in the second image after the leading edge, and in the other images after the trailing edge? It is present in both input and output, so I guess it is not your power supply? @eljonco – well spotted. Zooming in it is clear that the small amplitude wave impressed on the flat top of the leading edge is the same frequency as the envelope wiggle to the far right. With more captured waveform the exponential damping of this sine wave should be visible. Taking the leading edge observation – we know that the drive signal is from a signal generator running on Hi-Z, probably through a fairly long coaxial test lead. This places a slightly lossy distributed LC ‘component’ between the ‘pure’ signal generator and its load – the consequence is a characteristic damped sine wave ringing when that ‘component’ is excited by a step change. This same effect is seen at the trailing edge. The trace is complicated by the Drain circuit ringing. A portion of this is coupled back through the Miller capacitance and adds in. By chance, the two frequencies are different enough that both are clearly visible.